Okay, I am completely addicted to the Almond Crunch Granola that Karla posted back in May. I use it as cereal or a crunchy addition to yogurt. I have to say it has become a staple in my diet and I make sure I always have it on hand. 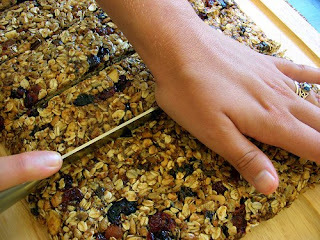 The other day I ran across an episode of the Barefoot Contessa on Food Network where she was making Homemade Granola Bars which look absolutely delicious. The contain a bit more sugar than the Almond Crunch Granola, but will still make a nice snack for the family. We are getting ready for a weekend camping trip and I thought they would even be a nice breakfast treat. This recipe yields 12 to 16 bars.